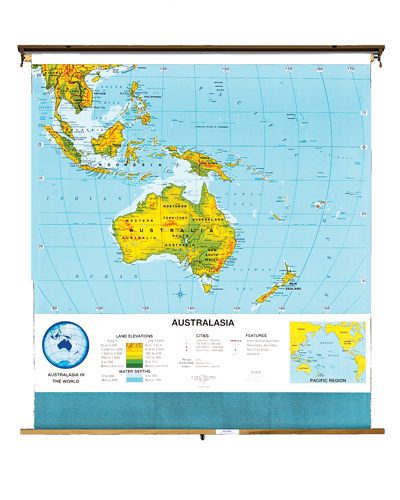 A Physical Political Map of Australasia shows the land elevations of the continent of Australia, the Southeast Asian Islands, and the Pacific Islands. An inset map shows the Pacific Region. 51 inch x 51 inch . Markable. Includes a world locator inset map that shows Australasia's relative location in the world. Five land elevations and two water depths shown. Mounted on a spring roller with backboard and end brackets. This product was added to our catalog on Wednesday 26 January, 2005.